Last week I blogged about the Space Launch System (SLS) heavy lifter program that NASA is working on. One of the missions of the SLS will be to launch the Orion Multi-Purpose Crew Vehicle (Orion MPCV) into Earth orbit and beyond. The Orion is intended to carry up to six astronauts on missions to the International Space Station (ISS) and interplanetary exploration. The MPCV version of the Orion was announced by NASA in mid-2011. Its design was based on the Orion Crew Exploration Vehicle which was intended to be carried by the cancelled Constellation heavy lifter program that preceded the SLS program. Three different capsule designs intended for three different types of missions were rolled into a single design for the Orion MPCV. The Orion MPCV has two main modules. 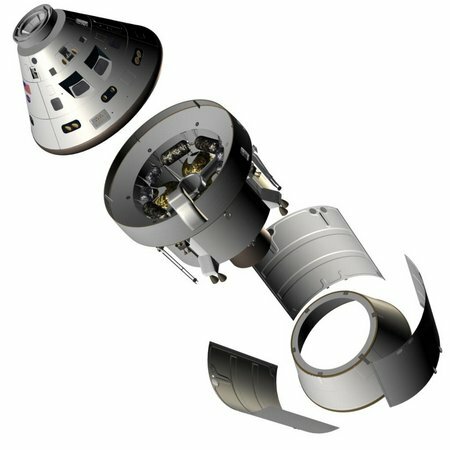 The Orion command module (OCM) is being constructed by Lockheed Martin. The Orion Service Module (OSM) is being built by Airbus Defence and Space. The first uncrewed test launch of the Orion was carried out by a Delta IV Heavy rocket in December of 2014. It landed in the Pacific Ocean at the designated location. The first Orion crewed mission is not expected to take place until 2021. The OCM is similar to the Apollo command module based on the same truncated squat cone shape. It will provide living space for the crew, storage of consumables and research instruments. It will also serve as a docking port for transferring crews to and from other space vehicles such as the ISS. It is about sixteen feet in diameter and about ten feet tall. It masses about eight and a half metric tons. The OCM has about fifty percent more crew space than the Apollo module. Other improvements include an automatic docking system, improved waste management, a nitrogen/oxygen atmosphere that can be maintained at sea level pressure. The computers on the OCM will be much more powerful than those on the Apollo. The control panels are based on the new "glass cockpit" design which display information on LCD panels. The displays can be reconfigured to show different types of information. The OCM will be the only part of the Orion spacecraft that will land after each mission and be reusable. The OSM will serve as the power and propulsion section of the Orion spacecraft. The OSM is cylindrical in shape with a diameter of around sixteen feet and a length of about sixteen feet, including the thrusters. It will provide the water and oxygen for crew life support. It will also store electrical power for operations and maintain a livable temperature within the crew module. It masses about three and a half metric tons with a capacity for eight metric tons of fuel. The OSM will provide thrust for changing obits, docking and extra orbital missions. It will be jettisoned at the end of each mission before the OCM capsule lands. There is a new Launch Abort System which will fire a solid rocket to blast the crew module free from the launch vehicle in case of an emergency during launch. The Orion MPCV in combination with the SLS will allow the United States to begin the serious and sustained exploration of the solar system including missions to the Moon, Mars and asteroids.